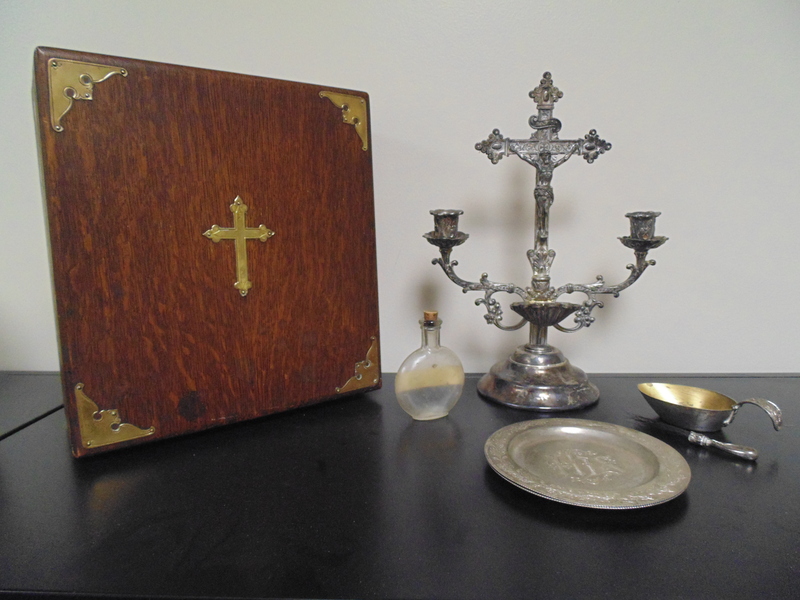 (Information about Father Bourg and his portable altar came from the Dictionary of Canadian Biography and the New Brunswick Virtual Museum (where the picture of the portable altar also came from). Brass with remnants of silver plate. This chalice is reputed to have been used by Jesuit chaplains at Masses on Civil War battlefields. It is not known whether it was used on the Union or Confederate side, and this borderland ambiguity reflects the position of Missouri in general and the city of Saint Louis in particular. From the state’s origins in the Missouri Compromise (1820) through the infamous Dred Scott case (1847-1857) —- a case which rested in part on Saint Louis’s geographical location on the Mississippi River border separating slave-state Missouri and free-state Illinois —- into the St. Louis Riot of May 11, 1861, Missouri formed an ambiguous frontier between north and south, east and west (“gateway to the west”). (The first Jesuits to cross from Maryland and settle in Saint Louis had brought their slaves with them.) The ambiguity carried into the Civil War in which Missouri was a slave state under Union control. Throughout the war, Saint Louis was a city of divided loyalties that pitted against one another members of businesses, congregations, families —- and, presumably, the Saint Louis Jesuits, especially those of different Belgian and German-speaking origins. It is fitting, then, that we do not know whether this chalice was used by a Confederate Jesuit chaplain or a Union Jesuit chaplain. What is certain is that the soldiers who attended Mass on the battlefield would have believed that this chalice truly held the blood of Christ, and that this sacrificial blood, in some mysterious sense, helped make sense of the blood shed all around them. Portion of famous Matthew Brady photograph of Chaplain Mooney conducting mass for the 69th New York State Militia encamped at Fort Corcoran, before the First Battle of Bull Run 21 July 1861 . 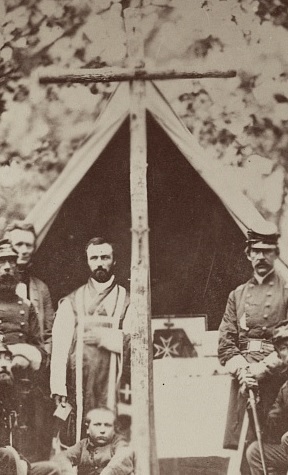 While not an officially issued “chaplain kit,” this close up of Chaplain Mooney conducting mass for the 69th New York State Militia encamped at Fort Corcoran, before the First Battle of Bull Run 21 July 1861 shows the altar set-up for a Roman Catholic service for Soldiers in the field (Photo: Matthew Brady, public domain). Chaplain P.P. Cooney celebrating Mass, Easter 1864. A similar Roman Catholic altar set-up can be seen a bit better in this artist’s rendering of Chaplain P.P. Cooney, C.S.C. Chaplain General of Ind. Troops in the Field, celebrating mass for the troops Easter, 1864. 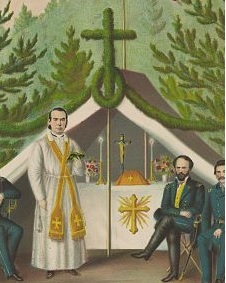 This worship service of the Ninth Massachusetts Infantry in 1861 shows a similar altar set-up as those above. This one, however, shows a crucifix attached to the front of the larger cross in front of the altar. The Homan’s Sick Call Outfit. This box was apparently part of the kit used by a Catholic chaplain or minister assigned to the 23rd Infantry Regiment. The accoutrements aren’t original to the box but were the standard accessories of the outfit (author’s collection). 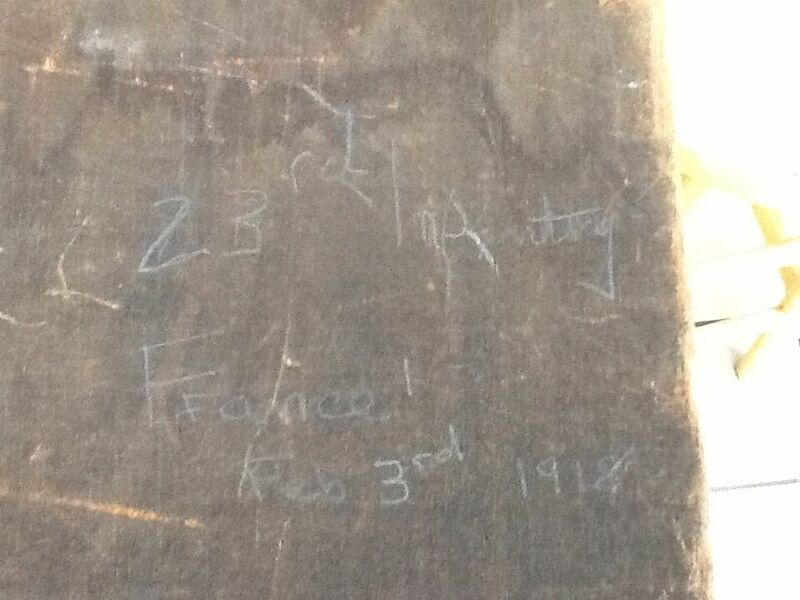 The bottom of a box from a Homan’s Sick Call Outfit, written in pencil is 23rd Infantry, France, February 3, 1918 (Author’s Collection). Knights of Columbus or as an official chaplain in the Army, being a smaller and more portable kit than the ones provided by the Church. 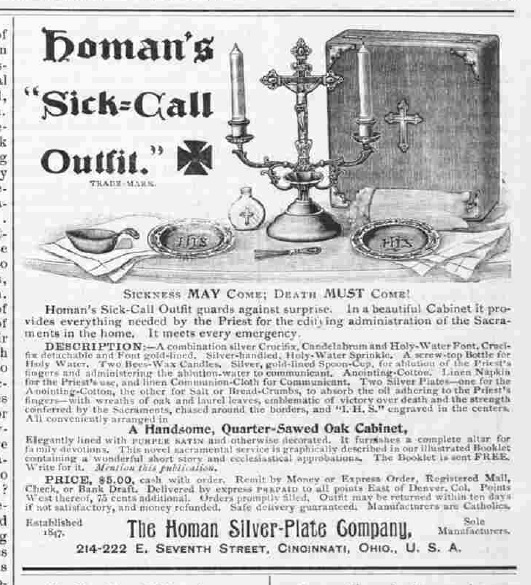 From my research, it appears this may have been used by Chaplain Julius Babst who was a Roman Catholic chaplain assigned to the 23rd Infantry Regiment. The fact that his award citations and military records indicate that he was in the 23rd on the date written on the box; he was a Roman Catholic chaplain and this box was produced for Catholic use; the box came from an estate where there were other items from the 23rd Infantry Regiment and was in California where Chaplain Babst died; all lead me to conclude that the likelihood is high that Chaplain Babst took this box to war in France and probably used it to perform the sacraments for Soldiers in his unit. “Portable altar with three panels that fold into a compact, fabric-lined carrying case with a leather strap handle. Used by Father George R. Metcalf of St. Paul, Minnesota. Metcalf served as chaplain for General George S. Patton during World War II. The style of the military uniforms depicted in the painting suggest that the altar was originally used during World War I” (In the collection of the Minnesota Historical Society). 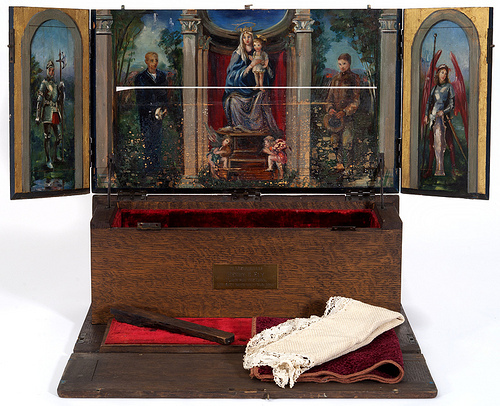 This portable altar is like one used by Chaplain McGavern in the Korean War, which you can see on the Korean War Kit page. The following chaplain kit was originally produced for either Catholic or liturgical Protestant, having a “reversible” cross with the corpus on one side and “IHS” symbol on the other. However, the owner of this kit removed the “IHS” symbol and put it above the corpus. This kit also includes the chalice with intinction insert, a ciborium, a lavabo bowl, paten, two candlesticks, two bottles (for wine and water) and a small container with individual cups, with most of the metal items being marked with “US.” This particular kit is missing the decorative cover for the back of the case (author’s collection). Going into the Vietnam era, Veteran chaplains would have used the kits they had from WW2 and/or the Korean War. You can see more about them on their respective pages. While Jewish chaplains, by necessity, continued to use the larger, bulkier kits, this next kit was developed and began being issued to Protestant and Catholic chaplains during the Vietnam era. It is designed as a light-weight kit that has everything needed to perform a worship service with the celebration of communion, including having candles! I’ve been told that it also floats, to avoid loosing it in situations where you may find yourself in water, like what Chaplain Francis Sampson experienced in WW2 and the Korean War. As much as this kit is smaller and lighter than the previous kits which were metal and even more transportable than the WW2 kits, it still wasn’t perfect. During the U.S. invasion of Grenada, the chaplains were not permitted to jump with these chaplain kits because of their size. Further, they could not be added to the airdrops since ammunition was deemed as more important to the mission(!). 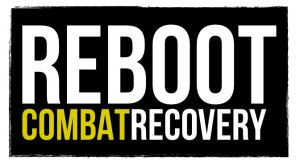 “Space and weight limitations were very critical to the Ranger Battalion. Ranger chaplains therefore had to take as little equipment as possible. Chaplain Mack modified his chaplain’s kit to a small demolition bag carrying a communion cup and a host container plus some New Testaments, a Jewish Prayer Book, and rosary beads. Sacramental wine was carried in an extra canteen.”1 Not long after this operation, the new, even smaller, chaplain kit was developed which could be either worn on the pistol belt or attached to a rucksack enabling chaplains to carry them along during parachute jumps. The “Type 1” chaplain kit was issued early during the Vietnam War. It has the same pieces and parts as the “Type 2” (which was issued later in the war and beyond) with only minor differences. The most noticeable differences is the bag, which is a thinner, more shiny material than the Type 2 and doesn’t have a securing strap along the length of it (only two short ones over the top). The carry strap is also thinner than the Type 2, with an added shoulder cushion piece on it. There’s also a slight difference in the finish of the chrome pieces and the plastic bottles for the wine/juice and/or water are different. Finally, the plastic container inside the ciborium is larger in the Type 1 kit. The foam insert in the Type 1 kit was such that it deteriorated very badly over time. I don’t think I’ve seen the foam from a Type 1 that has survived. The foam in the Type 2 is tougher and more durable. Documents sewn into the interior flap of the Vietnam era (Type 2) chaplain kit (author’s collection). Above is the current issue chaplain kit in the Woodland Camouflage pattern. Notice the cross is Protestant and Catholic (author’s collection).